The game “Castle Logix” by SmartGames is a beautiful wooden 3-D puzzle game that stimulates concentration and spatial intelligence as part of a fun and challenging activity. 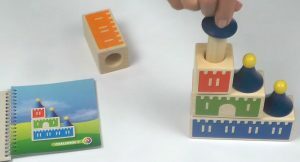 The game consists of 4 wooden blocks with holes and 3 towers of different heights topped by a blue roof. The goal of the game is to build a castle according to a proposed model. The game comes with a booklet containing 48 colourful challenges and their solutions. The 48 challenges are divided into 4 levels of difficulty. 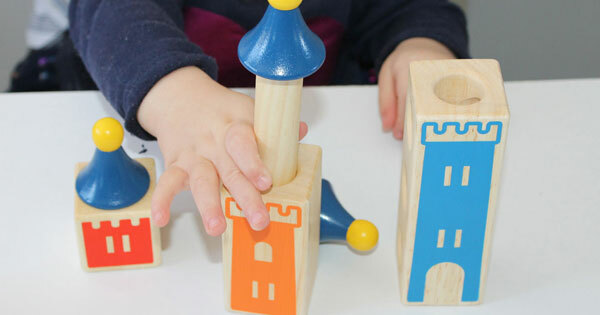 Each challenge requires the child to assemble the wooden blocks and the towers to build the castle represented by the picture. This game will help children develop the following cognitive skills: concentration, spatial intelligence, logic, planning and problem solving. The recommended age to start playing this game is three years old, but younger children can start exploring by putting the wooden blocks together in their own way. 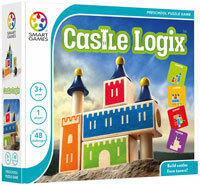 I think that “Castle Logix” is a very nice game that will help young children develop their spatial reasoning. The progression of the challenges throughout the 48 cards makes it a game with which they can grow and have fun learning for a long time. I have no affiliation with SmartGames. “Castle Logix” and “SmartGames” are trademarks of Smart NV, Belgium.